Thread: Two Iberia Papers with article. It's more complexe than that. We need to separate the Linguistic and Ethnonymic reality ( Early Germans coming from Scandinavia ) and their evolution throughout their migration from Vistula / Oder -> Sarmatia / Dacia -> Greece / Pannonia and Aquitaine / Iberia. It's basically like, you take modern Afghans migrating to Europe, when they are in Europe, there is Afghans, Pakistanese, Syrians, Kurds along with them. What is being a Visigoth when Euric entered in Iberia? Being part of the Balti Dynasty? Being a Noblemen close to the Balti? Or being any people who followed them from the Balkans to Iberia? When we see Hungarian Lombars with R1b-S21 or any kind of I1, we clearly understand that they are from the original scandinavian / north german stock, but what is the history of a Visigothic J2a or E1b? This clearly a terminological work, what is being Visigothic at this point, a Loose Confederation or a Germanic tribe? Very early Gothic uniparentals might be relevant here. An E1b all the way up in Poland? The G2a and I2a from the previous inhabitants is not surprising, nor the R1b and R1a. So the E-V13 might be a Neolithic remnant that got more important during the Bronze Age in or around Central Europe? Also in the Balkans itself. It's phylogeny shows that it expanded in the Bronze Age. The area of highest concentration is not necessarily where it originated. This are supposedly Wielbark samples from Poland and are not associated with the Roman frontier of Goths,many archeologist deny any connection between Wielbark to Chernyakhov culture,let alone Scandinavia. And the I1 found there if i remember correct was I1-Z63 with very little connection to Scandinavia,the supposed migration. Perhaps these lineages were part of the neolithisation of the Steppe? There's been nothing about the plague being in Spain to my knowledge. Is it possible it had burned out by the time the majority of the Central European Beakers got there? However, it's possible they haven't tested the Spanish samples yet. There's also the fact that they didn't admix for about 500 years to consider. This is a different situation from the one in Central Europe, isn't it? Unless the plague, if it arrived at all, didn't arrive until then, but then, the women survived, so it still doesn't make sense to me. If it originated on the steppe (it's found today in marmosets there) then they may have slowly built up a resistance. Or, it may have been an immune gene to a certain pathogen in their environment which may have also coincidentally produced higher resistance to plague. The multi-ethnicity of the Visigoths helps to explain the results of the Ralph and Coop analysis based on IBD. They said they found almost no trace of the Visigoths in Spain, Italy, and even France. The impact may still have been small, but the lack of impact they found may also be due to the fact that they were looking for "Germanic" dna. There is the decline of neolithic settlements in Central and Western Europe ca 5.3 ka, which is likely associated with the spread of the plague. If you look at the TMRCA of the neloithic Y. Pestis branch, it probably started to spread about 5.8 ka, but from where? The expansion of the bronze age invaders, 4.5 ka is much later, I guess both farmers and bronze age invaders with steppe ancestry must both have built up immunity by then. It however seems to me that the farmers never really recovered from the 5.3 ka decline. Climate also may have played a role. When climate deteriorates, often in history pastoral tribes invade farmers land. The man in the video says there were some few finds of mass graves that point to violence during bronze age invasion and claims more will be found. I find that highly speculative. It also does not explain why uptill now more such mass graves have been found associated with the late phase of LBK farmers than assiociated with bronze age invaders. We don't know what realy happened, and many different theories will be put forward. Before there was already a suspicion of replacement of Y-DNA. It proves to be even more severe, and there is also a clear timeframe now. It took 500 years. But I am also surprised there were also so many women with steppe ancestry. It was always told before that this was an invasion of males only. Another surprise is that the invaders in some cases switched to the local language when they settled. The J2 Semitic tribes did the same, they switched to Afro-Asiatic, and how about the Etruscans then? To me they still seem to be descendants of Urnfield invaders. No, not E-V13, it is impossible because TMRCA is to young. And E-L618, the ancestor of E-V13 seems to be involved in Cardial Ware, there is a Croatian Carded Ware sample and also a 7 ka sample based on STR in Catalunia. 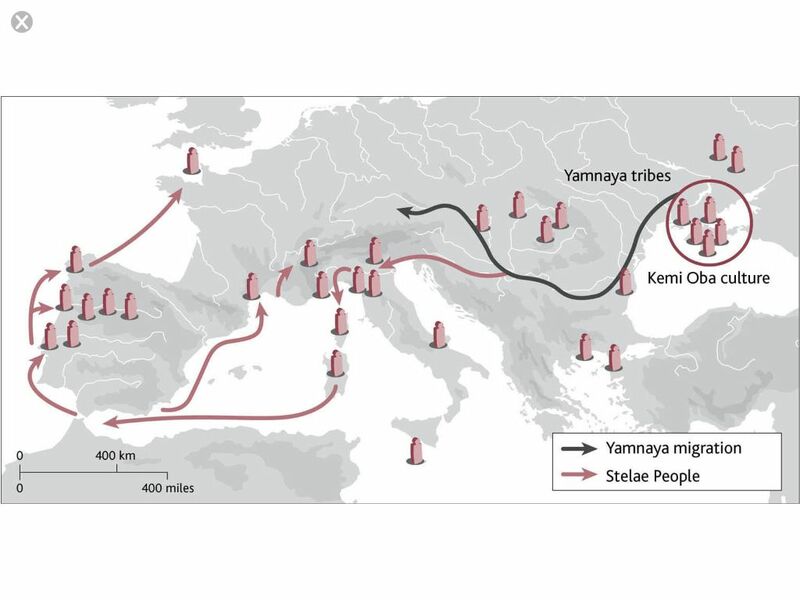 It is more likely that different clades of E-V13 were involved in 2 seperate westward bronze age expansions : one with IE people over land via central Europe, another with bronze age people from Anatolia/the Aegean westward through the Mediterranean. For J2b, it is possible theorethicaly, but unlikely. Bicicleur: It proves to be even more severe, and there is also a clear timeframe now. It took 500 years. Did it take 500 years, or it only started 500 years ago? Bicicleur: But I am also surprised there were also so many women with steppe ancestry. It was always told before that this was an invasion of males only. This is why Lazaridis had to issue that rebuttal last year on behalf of the Reich Lab stating that women from the steppe did make the journey, although perhaps in some areas there was some skew toward men. Bicicleur: Another surprise is that the invaders in some cases switched to the local language when they settled. It is indeed not unheard of for this to happen. As to the Etruscans, that is what those who have minutely examined the archaeology have always claimed: continutation of Villanovan, no sign of invasion etc. It was always explained away by amateur geneticists on the web as just standard anti-migrationist talk. We shall see. What evidence is there for a Scandinavian origin anyway? Jordanes? Why would we found I1 ìf they didn't came from Scandinavia? One day Scandsmen decided that, " hey those Spanish guys are gettin' that rep all over europe " let's just rename that land Gotaland for making furor ". That was a theory held in the past,and the migration from Gotaland to Wielbark then to Chernyakov culture,however today that theory is largerly dismissed,even the pressumed migration from Wielbark to Chernyakov,so the samples you posted about early Goths from Poland. Or unless the Goths were flying from Wielbark to the Roman empire and the Balkans,cause even Chernyakov is view today as multi-ethnic or more regional development. Today, scholars recognize the Chernyakov zone as representing a cultural interaction of a diversity of peoples, but predominantly those who already existed in the region,whether it be the Sarmatians, or the Getae-Dacians (some authors believe that the Getae-Dacians played the leading role in the creation of the culture). Late Antiquity authors often confused the Getae with the Goths, most notably Jordanes, in his Getica. I am only finding time to reply now. - I2a1a-M26 and I2a1b-M423. Until the MLN, the I2 individuals all belonged to I2a2 - mostly the now rare Western European L1228 clade, but also to Z161. - G2a-Z1903 (downstream of L30, L140 and CTS342, TMRCA 4500 ybp, found all over Europe) while earlier Neolithic G2a belonged mostly to G2a-PF3148 (like Ötzi), a rarer clade today found notably in Sardinia and the Middle East. So there seems to have been a significant population replacement between the Middle-Late Neolithic and the Chalcolithic. The newcomers were also descended from the European G2a-I2a mixed population, but it looks like a male elite, probably originating from the Balkans, started replacing other Neolithic lineages in Iberia, and based on the modern distribution of I2-M26, I2-M423 and G2a-Z1903, across most of central and western Europe. In this study, these new lineages only show up in southern Iberia, while R1b-L23 (with some L51 and P312) makes its appearance only in central and northwest Iberia from circa 2100 BCE. By the Bronze Age (from 1800 BCE), samples in all Iberia are almost exclusively R1b, overwhelmingly of the L11 and P312 variety, with the first Z195 showing up in Valencia c. 1700 BCE (I3997) and another DF27 in La Rioja c. 1400 BCE. Surprisingly, no new haplogroups crop up in Iron Age samples. What is striking is the complete absence of haplogroup E1b1b, J1 and J2 anywhere in Iberia before historical times. The E-L618 (mistakenly reported as E-V13) found by Lacan et al. (2011 bis) in Early Neolithic Catalonia seems to have been a rare exception. The first R1b-L21 comes from Tarragona (Roman colony) during the Late Imperial period (200-500 CE). The first trace of J2a shows up as J2a-L558 (found esp. in East Mediterranean) in Granada some time around 265–427 CE (Late Roman period). The earliest actual E-V13 appear in the 6th century in Catalonia, during the Visigothic period, alongside a clearly Germanic R1b-U106 (Z381). Many other E1b1b samples were identified during the Visigothic period in NE and SE Iberia, although the subclade isn't available. In other words, it is not impossible that E-V13 was brought to Iberia by Germanic tribes. If that is the case, the percentage of (Slavo-Celto-)Germanic Y-DNA in Iberia would be much higher than previously thought. E-M81 first arrives during the Moorish period. It's possible that some of it already came during the Roman period, but there is no evidence of it so far. The earliest actual E-V13 appear in the 6th century in Catalonia, during the Visigothic period, alongside a clearly Germanic R1b-U106 (Z381). In other words, it is not impossible that E-V13 was brought to Iberia by Germanic tribes. If that is the case, the percentage of (Slavo-Celto-)Germanic Y-DNA in Iberia would be much higher than previously thought. Visigoth with E-V13 - sample I12031 - was a Visigoth only culturally, autosomally that person had no Germanic ancestry, but he also had no any native Iberian ancestry. It was someone with a lot of Paleo-Balkan ancestry. Visigoths marched across the Balkans on their way to Iberia, absorbing some local groups. The most Germanic (about 2/3) of all Visigoth samples was I12163. All others were autosomally mixed. I12032 and I12162 were predominantly Northern/Central European but also mixed with other things. I12034 was an acculturated native Iberian (80-85%) with only minor Germanic admixture. What about the Alans, did they contribute any Y-DNA to Iberia? - I2a1a-M26 and I2a1b-M423. Until the MLN, the I2 individuals all belonged to I2a2 - mostly the now rare Western European L1228 clade. In this study, these new lineages only show up in southern Iberia, while R1b-L23 (with some L51 and P312) makes its appearance only in central and northwest Iberia during the Chalcolithic. By the Bronze Age, samples in all Iberia are almost exclusively R1b, overwhelmingly of the L11 and P312 variety, with the first Z195 showing up in Valencia c. 1700 BCE (I3997). The earliest actual E-V13 and J2a appear in the 6th century in Catalonia, during the Visigothic period, alongside a clearly Germanic R1b-U106 (Z381). In other words, it is not impossible that E-V13 was brought to Iberia by Germanic tribes. If that is the case, the percentage of (Slavo-Celto-)Germanic Y-DNA in Iberia would be much higher than previously thought. Ah, that really clears my view up a lot. I remain convinced that the spread of metallurgy is accompanied by a spread of people (often elites) and is very rarely spread through cultural diffusion, but I always thought that there wasn't any population change between the Late Neolithic and Early Chalcolithic as shown by the ancient DNA literature, so I assumed R1b-L51 or perhaps J2 was involved in bringing copper metallurgy to Iberia but that those copper-bearing samples hadn't been found yet. Now there has been demonstration of the arrival of new lineages, the necessity for R1b-L51/J2 in the Late Neolithic-Early Chalcolithic is greatly reduced and almost non-existent if it weren't for the spread of anthropomorphic stelae, unless something incredible is involved like the invaders themselves being stratified with some tiny elite of L51 at the top (really unlikely but don't rule it out until we can actually find out where L51 came from). One potentially important point but my memory and Google is failing me - was Kemi Oba Y DNA I2(a1)? I seem to remember somebody saying that but I can't find it, if so that would put a lot of evidence of an origin of these Chalcolithic newcomers in the Kemi-Oba culture (somebody must have spread those anthropomorphic stelae given the amazing similarity). EDIT: I've also floated ideas for two migrations like above by the way, one of these I2a1 etc. guys and another of R1b-L51 pretty soon afterwards - that would depend on the chronology of the arrival of the anthropomorphic stelae (i.e. if it arrived after copper metallurgy spread). Yamnaya was definitely not L51 though, that should be clear from the Hungarian Bell Beaker samples we have. There's anthropormorphic stelae at Hamangia - which presumably predate Kemi-Oba? If the Steppe apparently first received copper metallurgy on a large scale from the Balkans, it could be associated with this. If the Hamangia stelae was from late Hamangia, it would be related to the Boian culture and ultimately to Cucuteni. Perhaps something like Cucuteni is a dark horse for the origin of PIE speech, maybe picked up by Yamnaya tribes. In terms of what we know of the culture of PIE speakers it makes more sense than a purely Steppe origin. I'm just spit-balling here, but it is definitely an underappreciated hypothesis. This doesn't even factor in Maykop's influence on Yamnaya... though it doesn't seem kurgans are actually pivotal to the IE question as plenty of likely IE cultures didn't use kurgans. This are supposedly Wielbark samples from Poland and are not associated with the Roman frontier of Goths, many archeologist deny any connection between Wielbark to Chernyakhov culture, let alone Scandinavia. Just like many archeologists denied Steppe origins of Bell Beakers, or just like many archaeologists claimed that there was population continuity between Neolithic and Bronze Age Britain. Until DNA proved them wrong. Of course, when I say Visigoths, it does not necessarily mean Germanic. The Goths were already an ethnic hybrid of Germanics and Slavs before entering the Roman Empire, then they blended with people from the Balkans before moving west to southern Gaul, Italy and Iberia. Therefore a Visigothic E-V13 with Balkanic autosomal DNA makes sense. The Alans were a Central Asian people, but they also mixed extensively with Eastern and Central Europeans, so like the Goths they were an ethnic melting pot. But let's remember that Germany_Medieval were not people native to South Germany. They were Migration Period newcomers from the North, and DNA was collected only from males buried in elite Germanic reichen Graber. Germany_Medieval (with exception of women with deformed skulls) is genetically most similar to modern Danes and Southern Swedes. Goths were likely Scandinavian, like Jordanes wrote. Wielbark autosomal DNA confirms similarity to Jutland. 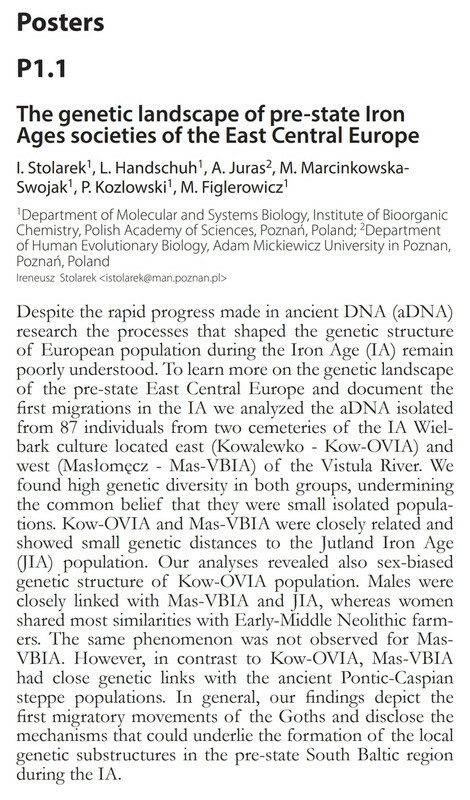 Slavic_Bohemia is of course Early Medieval Slavic DNA, not present-day Czech samples. so i can't read the paper of olalde but from what i read here those 40% are indeed "central european". now i wonder how olalde comes to the conclusion of 40% replacement. on his plot, if there were no dots added, only 2 people are nearly 100% central european the rest is already mixed. did he say when the admixture started? i assume it started already during those 500 years where both ancestries are present. or the incoming people already had iberian like ancestry and the real replacement was way more than 40%. The authors say the two groups co-existed for about 500 years before admixed people show up. I don't understand it, but that's what the samples show. You can say that when we gonna have Chernyakhov culture samples. Jordanes connects the Goths with Getae from antiquity,he mention a "Scandza" migration but from whatever early times,you should re-read him,and in no way he mention any Wielbark or whatsoever or date's the 'migration" in that period,that was archeological work from Gotaland-Wielbark-Chernyakhov to Roman empire. A logical explanation is that there was a caste system, which collapsed after 500 years. Gotaland refers to Gutes afaik. A North Germanic people.